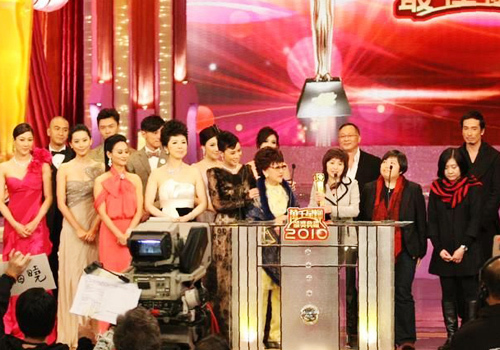 So, the TVB 43rd Anniversary Awards 2010 have come and gone. It promised a night of glamour, deserved recognition for some and lots of controversial happenings for others. Did it live up to your expectations? Here’s my account and thoughts on how the night went down. As someone who hadn’t been following the awards close in the run-up this year, I was totally caught off-guard by this award when they announced it. Should’ve remembered it from the previous year, but then again, these are awards that I’m not eagerly awaiting so never mind. Popularity is what it is… and Ray really is as popular as this award suggests. If Ray hadn’t come along to the acting class, I’m not even quite sure who TVB would have in his place. 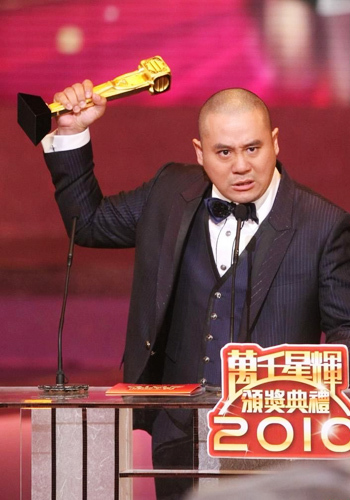 Talk all you may about his counterparts, but in his age group, Fung is the only one with both acting & singing chops. Here’s one I was really torn up about. I really like three out of five of the nominees – Selena, Natalie & Elaine. Selena is the steady performer, Natalie the gradual improver and Elaine, the one that had one bad first performance (does anyone still remember Chloe from Revolving Doors of Vengeance? God!) and then came back to impress all the time. There’s going to be so much outrage because Selena is cited to be the more deserving one. I didn’t watch A Fistful of Stances, which I’m sure was Natalie‘s awardpiece, I’m sure; nor did I manage to catch much of Selena in Can’t Buy Me Love, so I can’t really comment on who has improved the most in the course of this year. I will say that Selena is the stronger and more consistent actress based on past performances, though. Elaine has been this incredibly reliable supporting actress throughout the past few years. But that’s the thing, isn’t it? It’s not about being consistent and giving one good performance after another. It’s about floundering, and suddenly bam! this good performance comes out. However, this is one award that always causes controversy. 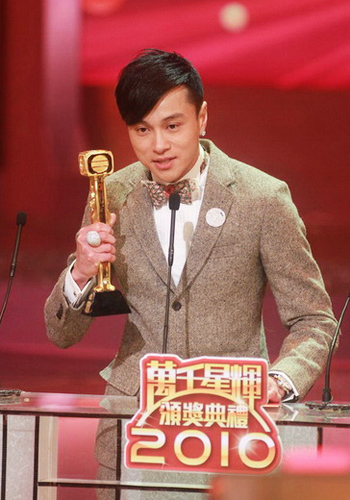 Since the initial two winners, TVB have never gotten this award right, IMO. Deserving improvers have never won and the eventual winners have never deserved to win at that point in time. I’ve always thought the winners improved greatly after the year they won. Soooo, is Natalie is going to have a great year ahead? Heh. Having said that, I do like watching Natalie (Maybe the fact that she’s a Love Bond alum has something to do with it, lol.) and I hope she rises up to be a solid supporting actress next. In her touching speech, she thanks her late mother sincerely and gives a shout-out to Lee Tim Sing (producer of A Fistful of Stances). Tim Gor really seems to be a favourite amongst the artistes. And well, I’m not sure this award is all it’s hyped up to be anyway. Leila Tong was (and still is) a great actress for her age back then and have never won it either. Bernice Liu never won it and still went on to do her movies. The best example, would of course be Fala Chen. She’s never won it either and she’s doing great in TVB at the moment. During the interview, Raymond Wong had a gigantic, gigantic sparkly ring on his (I think) right middle finger. That thing was huge! I wonder if it had an significant meaning or whether it was just for accesorising. I’m guessing the latter. 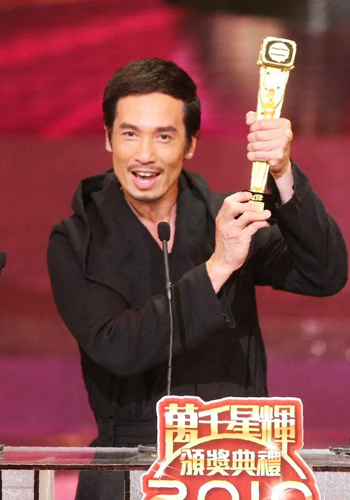 Flamboyance looked like what he was going for last night, and well, it worked in a way because he sure stood out in the sea of black that were the men of TVB. Him Law interviewed with Amigo saying that he was rooting for Ray W, and the two guys did a manshake. Too awesome. Have they acted together in a series before? There wasn’t a doubt in my mind who was going to take this award home tonight. I had hoped for Sheren previously, for Cheng Kau Mui was such an interesting, multi-dimensional character. But I guess even Sheren couldn’t surpass the favourite of many, Princess Chiu Yeung. She was bratty yet adorable, difficult yet compassionate, quirky yet charming. Princess, together with Charmaine, charmed (no pun intended) their way into the viewers’ hearts and I’m going to say, good job, Charmaine. (Wish I could say the same about that dress.) I’m not a fan her acting, but this was a fun character and a fun performance. This award completely took me off guard. At first I thought it was the same random award that Tavia won last year, but if memory serves me correctly, hers was a Performance of the Year award. This must be some “new” award TVB cooked up. I really really thought Mo had the Favourite Male Character in the bag, especially after Charmaine won hers. And he might have thought so too. Snark aside, my favourite part of his speech was when he thanked the scriptwriters and admitted that he doesn’t even understand some of it till today. Hee. And because some fangirls will completely skew all that I’ve written above, the conclusion to the above paragraphs are: Ray, yay! Kingsley, nay! This was a tough one for me to call. I predicted Kara because she was amazing in Fistful. I thought Nancy did so well in Gun Metal Grey compared to her other series (but unfortunately, anything to do with GMG will be and was snubbed). Elena Kong‘s Angela Auntie has a special place in my heart because of how hilarious she was! Susanna Kwan didn’t get to do much, IMO, but still gave a great performance nonetheless. But Fala, this was Fala‘s year. She was supporting actress (some of you might debate that she was joint lead instead) in so many series this year and delivered, exceeding expectations even, fine performances every time. It’s difficult to argue with a year like that. Even if the award is just for one series, because all those other series are always going to be in the back of voters’ minds. I do wish she had been nominated for Ngan Ping in CBML though. It would have made more sense. She admitted in her speech that she knew Ching Ching was not everyone’s favourite, and that she had heard a lot of mixed opinions about her role, but nevertheless would continue to persevere. This girl is going places. Links to Temptation is coming up where she looks to be leading, plus she’s singing the theme song too. Fei Fan Gor! The crowd goes absolutely wild and gets on their feet when Evergreen Mak was announced. The No Regrets cast look thrilled for him, especially his on-screen partner, Elena Kong. I get a little teary every time someone like this wins. All the hard work, diligence, years of solid performances going unnoticed, it all finally pays off. This year, Evergreen finally gets a memorable character in the form of Leung Fei Fan, and he packs a mean punch. Fei Fan Gor might not have been the best villain, but boy, I hated him. Brilliant chemistry with Wayne. I know it was hyped up to be a Sheren vs Charmaine competition, but to me there was simply nothing to contest. Charmaine played the dimensions of a spoilt yet endearing princess well, but there was no other woman who could take on the many layers and complexities of Cheng Kau Mui but Sheren. Every line she delivered at her enemies was like a punch in the gut, laced with venom. Her portrayal will be one to be remembered. She said, with great class, on how we need to appreciate the peace we have today, and hope we appreciated the kind of love story between Lau Sing & Kau Ku Leong that was told, despite there being no physical affection. I agree. It’s always much harder to tell of a romance in a period like that and it was due to the great chemistry between Wayne & Sheren which made it believable. Wayne wins again! There’s been a lot of talk on how Lau Sing < Chai Kau, and that is to be expected because they’re two very different roles altogether. Lau Sing is more righteous, more of a hero while Chai Kau was very… grey. More anti-hero. It’s like Wayne & Sheren swapped characters from Rosy Business to play in No Regrets. Wayne wasn’t given as much to work with this time round and I think that disappointed some people. But still, disappointment or not, Wayne is a formidable actor. 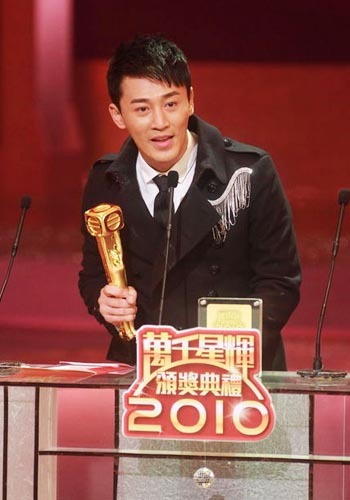 To borrow a line Kara Hui said about Kenneth Ma in the Best Supporting category, Wayne was so well immersed that he was Lau Sing, and Lau Sing was Wayne. Not enough could be said, and I’m so glad that the past two years, he has gotten what his talent and capabilities deserve. Bravo. Before the awards were announced, I called that Can’t Buy Me Love would take the prize, just to shake things up a little. 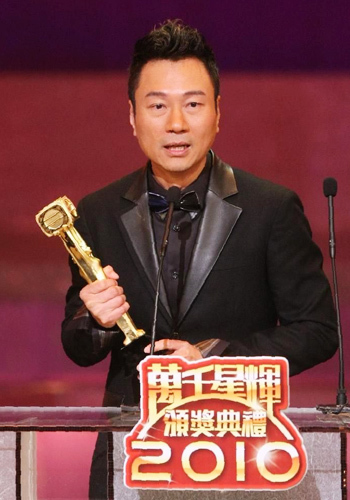 No Regrets had nearly swept away all the other awards that mattered, and there was no way that a series like CBML, with the number of TVB favourite siu sungs & fadans in it, would walk away empty handed. Especially with its ratings and the amount of pre-event publicity it garnered. For the episodes that I watched, I found CBML funny and there’s no denying the comedic talent it housed. But that’s not the most eye-raising thing. The most incredulous thing was that TVB once again repeats the Born Rich phenomenon of last year unto Gun Metal Grey and completely snub them of a best series nomination. It’s the black sheep “anniversary” series that got zero promotion at the Anniversary Gala. It’s terrible treatment of a great, gripping series, stellar performances, and a good story of the thin grey line told. Robbed. To TVB veterans who are planning to make a comeback next year, please don’t be disillusioned if your series gets named “Anniversary Series”. Look what happened to Ray Lui, Jamie Chik & Felix Wong. P/S: I did like A Chip of the Block & Every Move You Make, but wasn’t A Fistful of Stances also widely talked about? It’s not here either? I skipped the Most Admirable Programme Award (won by Hong Kong Architechture) and the Best Variety Show (won by The Voice 2, although I’m going to say that I liked that Krystal Tin got to go on stage since that will be the closest she will get to TVB giving her an award despite her stellar skills) since I don’t watch all these other programmes. Fun with Liza & the Gods took home an award for Best Hosts (I think?) and we’re treated to a large expanse of thigh by Wong Cho Lam as we see a live feed of them receiving their award at their concert. Tony Leung presented the trophy to the foursome and Wong Cho Lam, after treating us, treats himself to a pucker on Tony Leung‘s cheek. I don’t know which treat is scarier. How many times can Carol Cheng mention that Sheren Teng sat a whole year without getting any awards before getting tired? In what way does Mysteries of Love trump Gun Metal Grey? Could Ron Ng have hoped any harder that the ground would have opened up to swallow him whole after Toby Leung‘s remarks? What will 2011’s “new” award be? Did Adam Cheng look in the mirror before walking out of the house? All these unanswered questions. 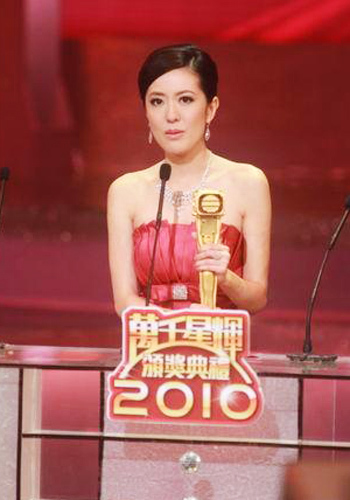 I don’t think I’ll be any wiser next year, but oh, I still look forward to you, 2011 TVB Anniversary Awards. Too much drama you bring!